The Best Travel Writing blogs from thousands of top Travel Writing blogs in our index using search and social metrics. Data will be refreshed once a week. Travel Writing newsletter is a comprehensive summary of the day's most important blog posts and news articles from the best Travel Writing websites on the web, and delivered to your email inbox each morning. To subscribe, simply provide us with your email address. Edmonds, WA About Blog I'm sharing my travel experiences, candid opinions and what's on my mind. If you think it's inappropriate for a travel writer to stir up discussion on his blog with political observations and insights gained from traveling abroad, you may not want to read any further. Facebook fans 531,935. Twitter followers 91,639. Tucson, AZ About Blog Travel copywriter and expert in baby boomer travel. Facebook fans 99. Twitter followers 1,050. About Blog Individual Coaching to Find Your Own Travel Writing Success. San Francisco, CA About Blog A subreddit for sharing trip reports from some of our favourite travel writers; professional or amateur. Facebook fans 1,210,414. Twitter followers 578,814. Cape Town, South Africa About Blog Award Winning Travel Writer, Earth Advocate and Beauty Seeker. Facebook fans 3,844. Twitter followers 12,387. UK, Canada & Czechia About Blog The Travel Writing Experts World Words is a specialist travel content writing agency. Our expert travel writers hand-craft travel articles and blogs, web copy, travel guides and more. Facebook fans 43. Twitter followers 2,851. Tampa, FL and Guanajuato, MEX About Blog Advice and interviews on the travel writing life: freelance writing, blogging, web publishing, and book publishing in the digital age. Facebook fans 3,017. Twitter followers 17,274. Greater Vancouver, BC About Blog BC Association of Travel Writers (BCATW) promotes and supports travel media in British Columbia by providing an annual symposium, monthly Meetups, the Buzz monthly newsletter, media cards, networking and social media. Facebook fans 207. Twitter followers 789. Singapore About Blog Whether you're a lover of history, politics, culture or design, Travelcene shares your passion for all things travel. Travelcene specialises in longform articles that dish out practical travel and photography advice for travellers, whilst providing a healthy dose of history, politics and culture. We also curate and feature city guides and flight deals that are relevant to the Asian traveller. Facebook fans 269. Twitter followers 26. Boulder, CO About Blog His travel articles have appeared in The New York Times, Yoga Journal, Delta SKY, Sunset, and National Geographic Traveler, among other publications. Facebook fans 458. Twitter followers 6,571. Cape Town, South Africa About Blog Travel writing and photography in and around the Western Cape by Tamlyn Ryan. Facebook fans 213. Twitter followers 1,070. About Blog Sophisticated cruising is a lifestyle choice committed to living life with grace, having respect for others, and an intense desire for personal growth. Learn about living the life of a sophisticated cruiser, what you need to know, what's changing, and how we can make your next trip a dream. Facebook fans 522. Twitter followers 1. London, England, United Kingdom About Blog As a contributing editor to the US travel magazine, ISLANDS I became a member of the British Guild of Travel Writers and still write travel articles several times a year. UK About Blog My Stylish Travels - Passionately blogging about everything in my lifestyle from travel, fashion, food and positivity! About Blog To balance the fiction with something else: I also do travel writing, the occasional work of humour, book reviews, essays on various topics I feel strongly about (plagiarism is one). About Blog Get the latest travel writing news, commentary, and gossip. Chasing wild sheep About Blog Award winning outdoors and adventure travel writing and photography by Matt Gibson (aka XpatMatt). Facebook fans 13,279. Twitter followers 28,203. San Diego, CA About Blog Learn the 6 steps to become a travel blogger and begin to write your way around the world! Facebook fans n/a. Twitter followers 10,363. Ohio About Blog A small-town Ohio girl trying to see the world. United Kingdom About Blog Lifestyle recommendations for men. Clothing, kit, food and drink, travel and entertainment suggestions for the discerning modern man. Facebook fans 20. Twitter followers 1,734. Westminster, CO About Blog Travel writing is an amazing profession. We interview travel writing experts and offer tips from travel editors and successful travel writers. Facebook fans 4,802. Twitter followers 3,388. 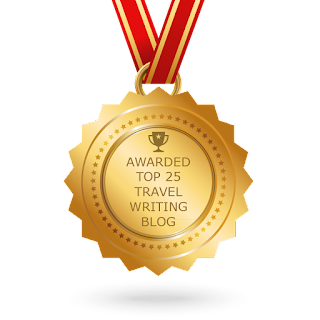 CONGRATULATIONS to every blogger that has made this Top Travel Writing Blogs list! This is the most comprehensive list of best Travel Writing blogs on the internet and I’m honoured to have you as part of this! I personally give you a high-five and want to thank you for your contribution to this world.